Who is Super Omega 3 aimed at? Super Omega 3 is for all sections of the population. The World Health Organization, along with all Western countries, recommends a minimum intake of 500mg a day of EPA+DHA in order to maintain health (1), and in particular, to support brain development and function. Yet numerous studies have shown that this level of intake is a long way from that currently achieved by American and European populations (2-8 times lower than daily recommended amounts). those at risk of cardiovascular problems. In theory, the body is able to produce EPA and DHA from plant-source omega-3 fatty acids, but intake of these has declined significantly over the years as a result of modern farming methods and changes in our diet (3). What’s more, the rate at which they’re converted is now very low as a result of our inappropriately-high consumption of omega-6 (4). Of far less benefit to the body, these fatty acids are nonetheless ubiquitous in modern processed foods and they mobilise all the enzymes (elongases and desaturases) needed for the conversion of plant-source omega-3s into DHA and EPA. So if you decided to increase your intake of plant-source omega-3 fatty acids, you would not see any benefits unless you simultaneously made significant cuts to your omega-6 intake. The fact is, we actually need to consume the same amount of plant omega-3 as we do omega-6, but our actual consumption of omega-6 is 15-50 times greater than that of our plant-source omega-3. In excess, omega-6 displace omega-3 and invade cell membranes in their place, resulting in the formation of billions of pro-inflammatory molecules (5-6) which are thought to play a key role in the development and exacerbation of chronic diseases. This adverse imbalance could be rectified through daily consumption of oily fish rich in EPA and DHA. Unfortunately, however, the level of contamination of these fish and the fact that they’re relatively inaccessible makes this an untenable option … Our actual intake of marine-source omega-3, EPA and DHA, is very far from the minimum amounts recommended, and further still from optimal levels. Supplementing with EPA and DHA is thus the simplest and most effective way of rapidly restoring healthy membranes. What are the recognised benefits of EPA and DHA? EPA and DHA are molecules that penetrate cell membranes – the layers of fat that demarcate our body’s cells. From this strategic space, they influence a wide variety of the body’s functions. They affect chronic inflammation and metabolic problems. When cell membranes take up EPA and DHA, they become more fluid and permeable. This is a really important point as when they’re more rigid, membrane exchange is restricted, promoting chronic inflammation. In addition, in cases of systemic inflammation, the body can ‘dip into’ this store of omega-3 fatty acids and convert them into anti-inflammatory molecules. With omega-6, the complete reverse happens – they are converted into pro-inflammatory compounds which encourages the development of metabolic dysfunctions such as insulin-resistance and metabolic syndrome. In recent years, 12 studies have demonstrated the benefits of supplementing with omega-3 for preventing acute coronary syndrome and other cardiovascular problems (7). Several mechanisms are responsible for these effects. First and foremost, supplementing with omega-3 helps lower omega-6 concentrations in membranes, and as a result, reduces their conversion into pro-inflammatory derivatives (8). It also acts on the atheromatous plaque that causes cardiovascular problems: omega-3 help lower blood pressure and reduce triglycideraemia (9) - high levels of triglycerides being a recognised risk factor for heart problems - by lowering the liver’s production of these fats and by increasing their elimination via LDL-transporters. They also stabilise atheromatous plaque by reducing production of inflammatory cytokines and by preventing monocytes from adhering to the vascular wall (10-11). Last but not least, omega-3 regulate a large number of genes, particularly those involved in fat metabolism. Several studies, including a prominent one published in 2002, show that supplementing with EPA for several weeks produces a significant decrease in depressive disorders in a high proportion of people suffering from major depression (12-13). In the same vein, post-partum depression may actually be linked to a reduction in cellular levels of EPA and DHA in pregnant women, resulting in significantly-reduced reserves by the end of their pregnancy (14). Scientists have discovered that it takes around a year for initial reserves to be restored to the levels required for healthy functioning of the serotonergic and cholinergic systems (DHA normally represents 10-20% of the fatty acid composition of the brain (15)). Low DHA levels in brain cell membranes do not only result in depression. They also lead to a lack of dopamine in the brain’s cortical regions, which may play a role in cognitive decline and impair the growth and development of the nervous system. Once integrated into the membrane, DHA makes it more flexible, improving the speed of transduction and neurotransmission. It also affects neural extension development, synapsis establishment, neural plasticity, maturation of neurons and their migration towards appropriate sites, and thus plays a significant role in motor, sensory and cognitive abilities (16). Carlson and his team thus demonstrated the benefits on learning capacity of a diet rich in omega-3. DHA represents more than 30% of all the fatty acids present in the retina (17). It is one of the most important compounds constituting the membranes of the outer segments of photoreceptors (18). The constant renewal of these cell components requires a regular and high intake of DHA or its precursors. DHA also supports a fundamental step in the phototransduction mechanism (19) which allows the conversion of light energy into a nerve signal (20). It is thus no surprise that deficiencies in DHA are associated with a number of visual dysfunctions such as AMD (21-23). What makes Super Omega 3 so exceptional? 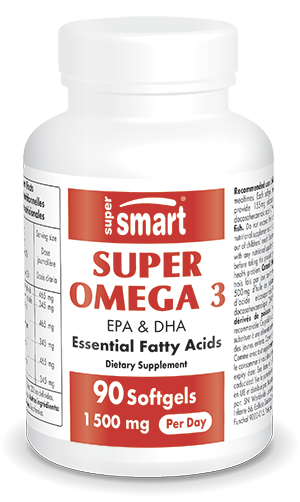 Like all our omega-3 supplements (Super EPA and Super DHA), Super Omega 3 contains EPA and DHA fatty acids in their natural form (triglycerides). These are more expensive than the synthetic form (ethyl esters), but studies show they may be more easy to digest (no ethanol is released) and twice as bioavailable. In addition, unlike many other laboratories, we have chosen to develop our product from wild fish oil. A number of studies have shown that farmed fish contain less omega-3 and more omega-6 (24). This is because such fish are fed inferior food: whereas wild fish feed on tiny fish, crustaceans and microalgae which are very rich in omega-3, farmed fish are often fed cereals and vegetable oils high in omega-6. What’s more, they are often farmed in inhumane and unsanitary conditions, and are routinely given antibiotics and anti-fungals. To ensure it offers optimal quality, Super Omega 3 is produced from a top quality fish oil, obtained from fishing zones off the coasts of Peru and Chile free from any industrial contamination. Fish are selected for their naturally high content in omega-3 fatty acids (sardines, mackerel and anchovies). These fish oils are thus certified Friend of the Sea® which means they come from sustainable fisheries that meet strict criteria, with guaranteed management of fishing quotas. Smaller fish are prioritised as larger ones have lived longer and have accumulated waste products: mercury, dioxins and even pesticides. In order to guarantee it is completely free from contaminants (PCB, heavy metals, dioxins), SuperSmart uses patented purification technology. This is a natural process called enzymatic hydrolysis which produces the highest concentration of EPA and DHA in a 100 % pure oil. In addition, as omega-3 fatty acids are highly-vulnerable to oxidation, we add natural ingredients to protect them and maximise their shelf life. Indeed, when omega-3 are oxidised, they are converted into trans fatty acids devoid of any health benefits. It’s therefore essential to protect them with antioxidants so that they retain their beneficial effects over time. That’s why SuperSmart has chosen to add tocopherols (vitamin E) to this exceptional formulation. It’s also why it’s best to store them in a cool, dry place, away from sunlight. What happens to the omega-3 once they’ve been ingested? Following ingestion and absorption, EPA and DHA are incorporated into cell membranes with phospholipids. This is a slow process: Super Omega 3 therefore needs to be taken every day for several weeks or even months in order to fully obtain its benefits. At the end of the supplementation period, the increased intake in omega-3 will be reflected in the composition of the phospholipid membranes. The NAT-2 study showed that supplementation with omega-3 produced a significant increase (up to 70%) in levels of these fatty acids in membranes. To achieve this, it is advisable to reduce your intake of omega-6 throughout the supplementation period. Do we know for sure that EPA and DHA reach the brain? Yes. These two compounds definitely cross the blood-brain barrier, by means of transport proteins specific to long-chain polyunsaturated fatty acids. Several clinical trials have proved that oral administration of omega-3 results in accumulation of these fatty acids in tissues of the central nervous system (25-26). M. Lavialle et S. Layé, « Acides gras poly-insaturés (Omega 3, Omega 6) et fonctionnement du système nerveux central », Innov. Agron., vol. 10, p. 25 42, 2010. Each softgel contains 155 mg of EPA and 115 mg of DHA.